HWPL, the Strong Peace Wind: Global Peace Summit by HWPL, Success! The World Alliance of Religions for Peace (WARP) summit that was held in Seoul, South Korea last week was a runaway success which saw hundreds of thousands of people participating in the global event. Among the influential international players who graced the auspicious gathering were more than 50 political leaders, including former and current heads of states from 30 countries, as well as about 700 religious leaders from 120 countries and over 600 members of the International Peace Youth Group (IPYG) representing 150 countries. 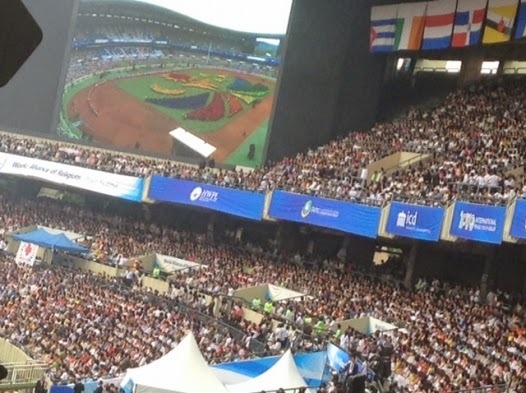 The summit's colourful opening ceremony was held at the iconic Seoul Olympic Stadium, while the signing ceremony of the solemn and highly significant Unity of Religion Agreement was held at the Seoul Convention Center the next day. More than 2000 prominent people from around the world -- transcending nationality, race and religion -- signed the peace agreement that exhorted global religions to unite and also called for an international law for the cessation of all wars. It also called on all the signatories to the agreement to become global peace advocates who should endeavour to deliver on this mandate to all people around the world and encourage humanity to co-operate in the work of achieving international peace. As the agreement was read aloud, it was emphasised that peace could not be achieved by one individual but could be realised through the unity of all people working together as one. Man Hee Lee, the chairman of the Heavenly Culture World Peace Restoration of Light (HWPL), expressed deep regret over the current unsatisfactory state of religion generally around the world. he said to enthusiastic applause. Chairwoman of IWPG, the International Women’s Peace Group chairperson, told the global meeting that while the agreement was only the beginning, it had the power to unite all people and to turn the whole world into one of peace. This one piece of paper connects one country with another and unites different classes and different religions as one. This generation is in need of change that is close to reformation. In creating a peaceful world and leaving it as an eternal legacy to future generations, today’s signing ceremony is very significant, she said.